Mile-a-minute weed, Persicaria perfoliata, is a highly invasive annual vine appearing on the East End and other parts of Long Island. Its triangular shaped leaves are very distinctive and easy to identify. 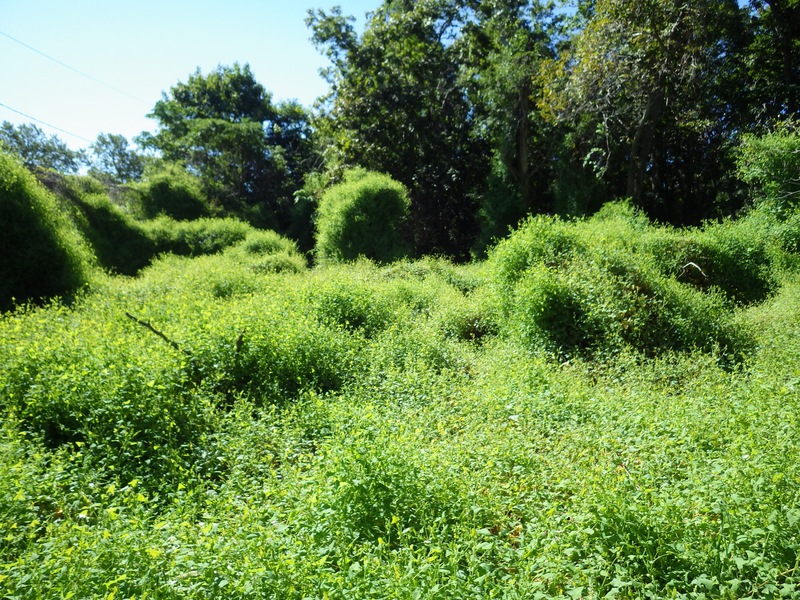 The weed is invading natural areas, residential yards, and landscapes. It thrives in areas of partial shade but can survive in full sun; mile-a-minute can potentially invade and establish itself in many environments. It is often found on the edges of residential properties near woods and sometimes on the periphery of field nurseries. It has also been spotted growing on the beach in different locations. This site was infested by mile-a-minute weed carried to Long Island by Hurricane Sandy. Mile-a-minute weed has several commonly used nicknames: Asiatic tearthumb, climbing tearthumb, and devil’s tail. These monikers describe the sharp downward-curved prickles or spines that grow on the vine’s stem and petioles. Any attempts to hand pull this weed without wearing heavy leather gloves quickly illustrates why tearthumb is one of its names. Its spines act like claws that enable the vine to attach easily to nearby vegetation. This adaptation allows it to grow straight up towards open areas of tree or shrub canopy without having to waste energy by twining like other plants. This rapid upward growth is the reason for its other common name: mile-a-minute. It takes advantage of most of the growing season on Long Island to produce multi-branched, thin-stemmed vines that are loaded with attractive blue fruit. When ripe, individual shiny black seeds are contained within a fleshy fruit that is very easily knocked off the vine. The seeds spread to new sites via migrating birds and other wildlife. Because the ripened fruits are so easily dislodged, hand pulling the vines after fruits begin to form in late July is not recommended. Leaving the vine alone in late summer and fall is a better option than trying to remove it from a site. Immature and ripe mile-a-minute fruit in late July are easily dislodged. 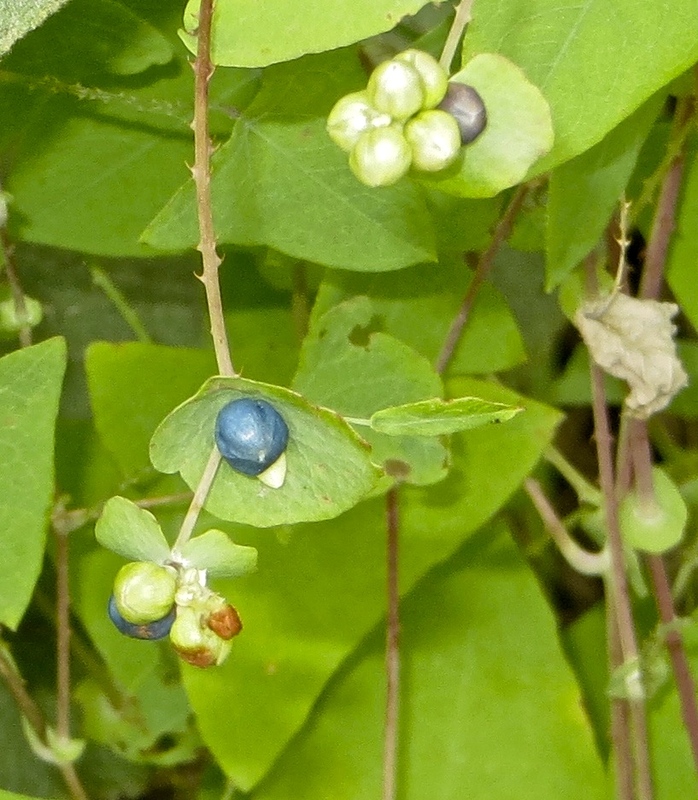 Recent research has shown that even immature green fruits can eventually mature off the vine to produce viable seeds for re-infestation. That leaves the months of May, June, and most of July to use cultural practices like hand pulling, string trimming, and mowing to suppress/control this weed. Because it has an annual life cycle, removing young plants has a very reasonable chance of significantly reducing the population. If mature plants are hand pulled after late July, the vines should not be placed directly into compost piles or other areas where the viable seeds can remain a threat. The pulled vines should be put under a tarp or landscape fabric until the fruit is no longer viable. In addition to cultural practices, the NYSDEC recently approved a 2(ee) recommendation for the herbicide glyphosate (Accord XRT II, EPA Reg. No. 62719-556) for post-emergent control of mile-a-minute vine in non-crop areas. Because glyphosate is non-selective, it should be used only in areas where no desirable vegetation could be exposed to drift. However, in such areas where many seedlings are growing, using this herbicide can be an efficient way to control young plants. Beneficial weevils eat the leaves of mile-a-minute weed. Since 2004, a biological control has been released to help suppress this weed. Developed by Dr. Judy Hough-Goldstein at the University of Delaware, a small weevil, Rhinomomitus latipes, was found to feed on the leaves and stem of mile-a-minute without eating other desirable plants. On eastern Long Island the weevil has been evaluated since 2012 through controlled releases of it in areas infested with mile-a-minute. The weevil has also found its way here from surrounding states that use it to manage this weed. The weevil begins to feed on mile-a-minute leaves in early spring and continues all season. It lays eggs in the plant stem, which the subsequent larvae weaken as they develop and begin to feed. The adults overwinter in the leaf litter at the ground surface. Unfortunately, there is a lot more weed than weevil, so we need to continue to increase the weevil population here. Funding cuts have meant CCE Suffolk must now purchase the formerly free weevils. We are hoping to develop a program that would not depend on re-introduction of the weevil every year. These beneficial weevils may play an important role in helping eradicate this scourge from our landscape before it becomes better established on Long Island. Andrew Senesac is Weed Science Specialist for CCE Suffolk. He can be reached at afs2@cornell.edu or 631-727-3595. 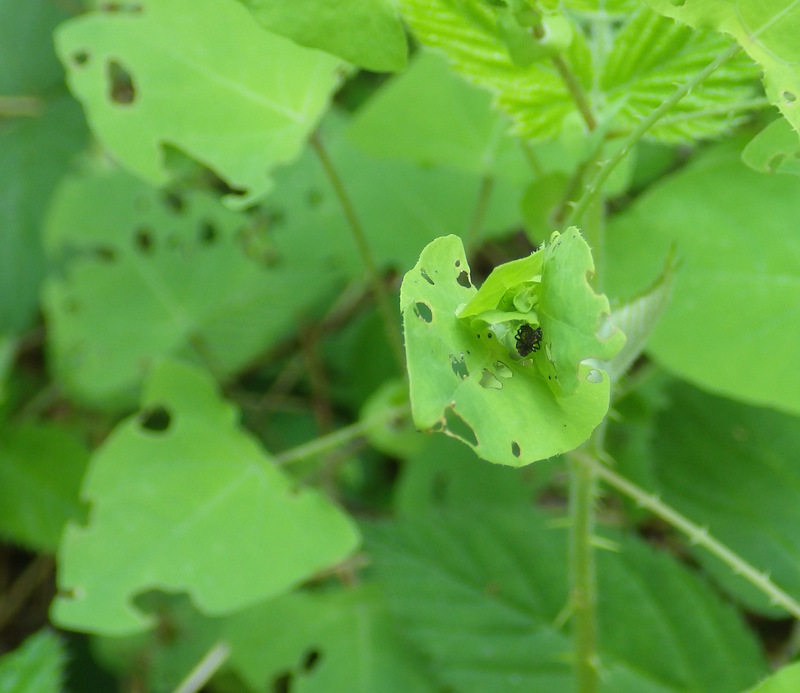 This entry was posted in Invasive plants and tagged herbicide, Hurricane Sandy, Invasive plants, mile-a-minute weed, tearthumb, weevils on August 5, 2015 by Robin Simmen.